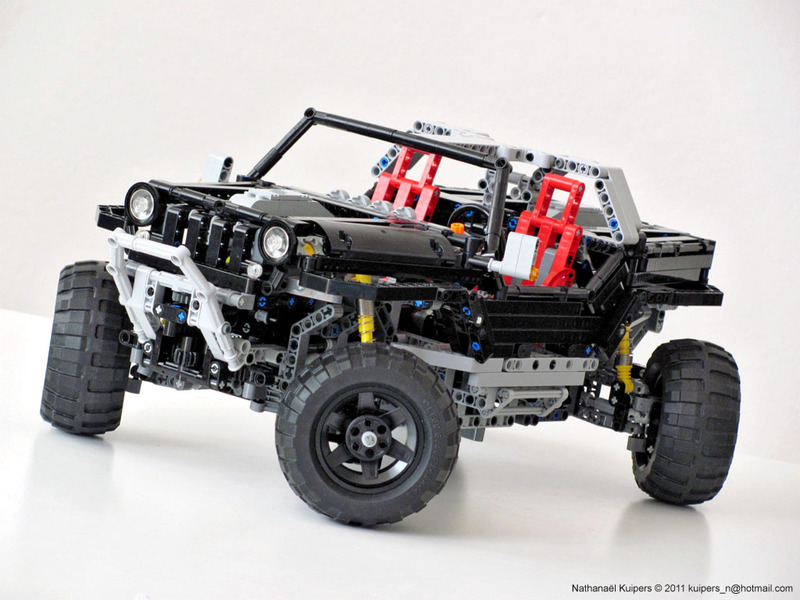 Nathanaël Kuipers, just presented his latest Technic creation. Truly one of a kind! It is a model from the no less fantastic and innovative, Jeep Hurricane. Hurricane is a concept off-roader unveiled in 2005, at North American International Auto Show in Detroit by Jeep, a subsidiary of Daimler-Chrysler. Among its distinctive features, this concept vehicle includes a couple of HEMI engines (one at front and another on the back), and several steering modes including the ability to turn itself completely around in place. The first thing I realized was how the new 8110, Unimog U400 wheels, should fit nicely in this model, once they become available. While Nathanaël reproduced most of the Hurricane details, like bumpers, seats, dashboard, each wheel independent suspension and aesthetics, this is nothing compared to the drive train which reproduces the several steering modes, apart from crab steering. 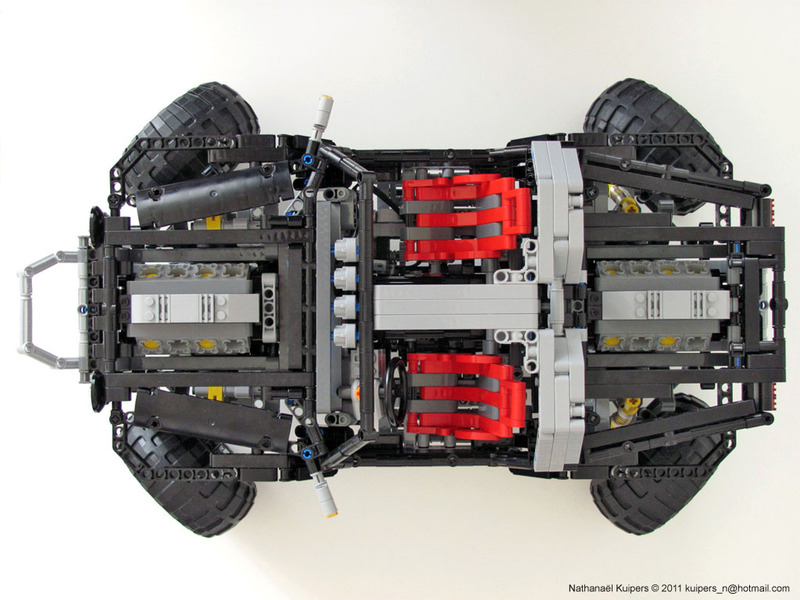 It is not the first Hurricane built with LEGO Technic, but most likely the first one with fully coupled steering control, delivering both "conventional" AWD with 4WS and Zero Steering with "Skid Steer" like, drive options. The original concept from Daimler-Chrysler must use some sophisticated electronics to control the wheels all-together and keep them properly oriented to fit the active steering mode. On his model Nathanaël needed this to be ensured via mechanical links. Somehow it turned too much complex to have the four wheels connected all the time and implement all the Hurricane steering modes at the same time. Thus the Crab Steering option needed to be drop. when the Zero-Steering mode is activated, in order to make the vehicle to turn over itself. It is about minute 2' 10'', the show starts and we see a demo from the Zero-Steering functionality. Did you realize the solution found, to make both steering modes work over the same design? Purely "Out-of-the-box Thinking" I'd say! If you did not, definitely it won't be the bottom view below that will enlighten you. Despite often the most interesting view from a large Technic car, it seems in this case a lot of the interesting bits and mechanics are tucked away deep inside the structure and its layers. Clearly the Hurricane is a 4x4x4 (Four Wheel Drive, Four Wheel Steer) class vehicle. So lets dig a bit more on the original Hurricane steering features,as explained into the great HowStuffWorks website. As you should be expecting, there is also additional information and tons of great photos, from other sources where Nathanaël uses to publish his models: MOCpages and Brickshelf. So, was it innovative enough this time? Just hope that Nathanaël would come now with a post from his own, to show the details how did he achieved this model. Insane and out of this world! Only one persone could make this! I saw a Hurricane on Brickshelf a year ago and it was wobbelly and didn't work all that well. It's just great work to see this monster in action and the looks come very close to the original. Two thumbs up for this MOC. I think I also remember seeing a model similar to this on brickshelf before. I don't understand why in some pictures it shows battery chamber and it others it shows a second seat? Also why not the video show the model zero degree turn? Is it just a feature or does it actually revolve in zero mode? There is a link in the post to a previous video from Contech7. Guess this is the model whose photos, you and Barman, have seen before at Brickshelf. How did he get 4 small bevel gears in that differential? Does it not only support 3? I am confused. notice the diffs used are the 2nd generation ones and not the latest version (3rd generation). Thus it is possible to get 4 small bevel gears in! Not easy to assemble, but possible. And surprisingly the 4th gear keeps in place. Wow this is great! His model is huge! 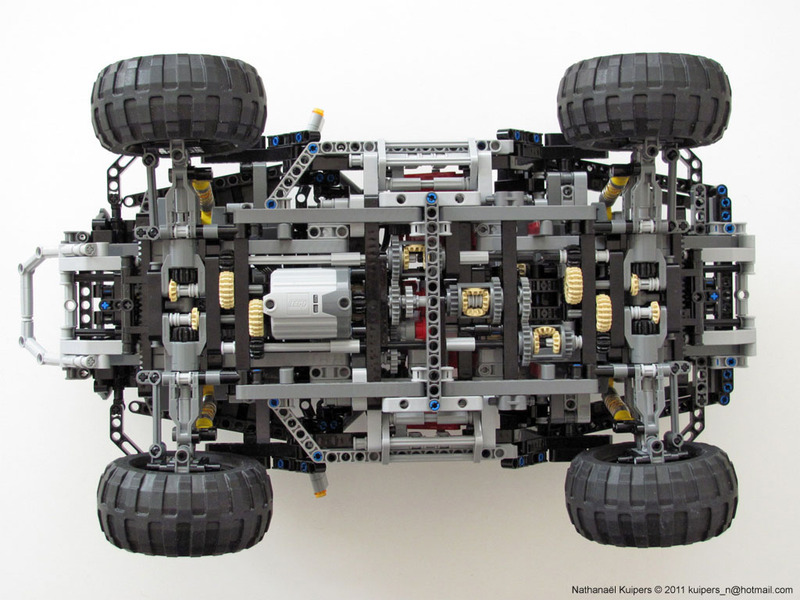 Much larger and complex than the one I made and more proportional to the tires, unlike mine. The mechanism on his model that pulls the tires inward for zero turning is like nothing I have ever seen before. All the gearing on his model seems very complex as well. Great job! Wish we could see it move on its own. that "how stuff works" picture is wrong, if you look at how the drive shafts are turning, the wheels would be pulling at each other. Awesome! In my opinion, this is the best Technic model ever made. i have created a gearbox that might help your steering mechanism.it will allow you to steer both the wheels on either side at the same time in the same dirrection or in the opposite dirrection. How did he get 4 gears in two that middle differential? It is not extremely easy but can be done manually with some perseverance. I've tested it myself, with success.